If you asked trainer Danny O'Brien who his favourite sire was, it's fair to assume his answer may be the late Waikato Stud stallion O'Reilly. The gun NZ stallion has produced O'Brien's Caulfield Cup winner Master O'Reilly, his champion filly Shamrocker (Austrialian Guineas-AJC Derby) and his Newmarket Handicap winner Shamexpress. 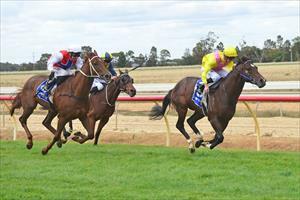 He has also had countless winners by O'Reilly and on Sunday another name was added to that list when three-year-old colt Bonville knocked over his maiden with a comfortable win for jockey Daniel Moor over 1400m at Echuca. "We have had a lot of luck with O'Reilly progeny and it's fair to say he holds a special place in my heart. He produced such wonderful racehorses from sprinter, to milers to stayers - it's a shame he is no longer with us," O'Brien said. O'Brien still has a few O'Reilly's in his stable and he is hopeful Bonville can continue on his winning ways when he steps up in trip at his next start. "He has always shown us a lot, but it's taking him a while to put it all together and he still has a way to go as everything seen so far is on raw ability. "Today, at his fifth start against this opposition, he just had to get the job done and he did, but he waited for them when he hit the front, but I am sure he will take much confidence from the win." O'Brien outlined that it was likely that his charge would step up to 1600m next start in a Benchmark 64 event.